Tired of pulling out flattened or wrinkled rolls of paper from your closet left over from the previous holiday? 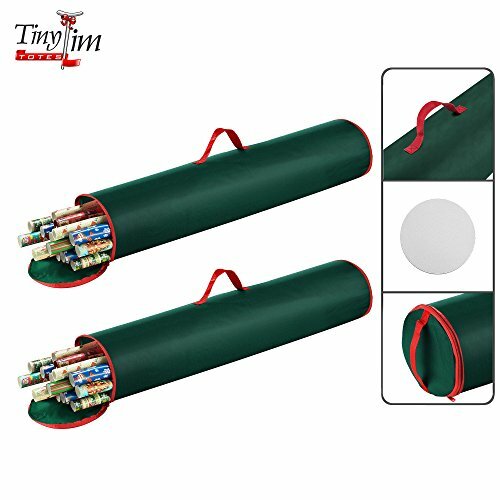 The Tiny Tim Totes has made it easy to store away those left-over and unused rolls of wrapping paper. Their innovative, Christmas and Holiday Gift Wrap Storage Bag is designed specifically to protect your wrapping paper, and to keep them in one place and ready for the next year. Sturdy construction, stitched seams, and gussets ensure that this storage bag will be ready for duty year after year. We improved this design with a reinforced bottom to allow this bag to store standing up in the smallest locations. With the Tiny Tim Totes, wrapping paper storage has never been so easy. Dimensions: 40.5" Long x 9" Diameter. Made from durable 600d Oxford Canvas. Keeps wrapping paper neat and fresh for the next season. Makes putting away and finding your holiday wrappings easy year after year. Stylish Christmas Green with Red Trim and Handles. LARGE - Dimensions: 40.5" Long x 9" Diameter. Perfect for those extra long rolls of wrapping paper. MULTIPLE - 2-Pack - Keep Birthday wrapping paper in one and holiday gift wrap in another, or give one to a friend! DURABLE: Made from strong, water resistant oxford canvas and nylon handles. CONVENIENT: Makes putting away and finding your holiday wrappings easy year after year. Store in a closet standing up or laying down, under a bed. STYLISH: Christmas Green with Red Trim and Handles. If you have any questions about this product by Tiny Tim Totes, contact us by completing and submitting the form below. If you are looking for a specif part number, please include it with your message.